"The Creator must have an inordinate fondness for beetles," the early 20th century biologist J.B.S. Haldane once said. "He made so many of them." If Haldane had been an astronomer, he might have said the same about the nondescript red stars known as M-dwarfs. As the name implies, they're small  no more than half the size of our sun, at most. They're so dim that not a single one, not even the closest, is visible to the naked eye. And they vastly outnumber any other type of star in the Milky Way: our galaxy has maybe 10 billion or 20 billion sunlike G stars but is home to 150 billion M-dwarfs  maybe more  adding up to some 80% of the galaxy's stellar population. That's what makes a new report by a group of European astronomers so exciting. 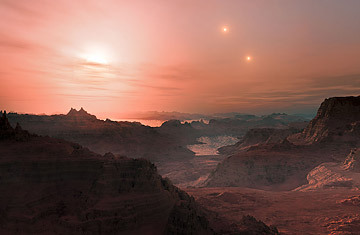 Working at the European Southern Observatory in Chile, the scientists have completed a survey of 102 M-dwarf stars and identified a total of nine "super-Earths"  planets up to 10 times as large as Earth  circling them. Two of the nine lie in their stars' habitable zones, the Goldilocks region where temperatures are not too hot or too cold but just right for liquid water and thus, conceivably, for the existence of life. In the case of an M-dwarf, the star's cooler, dimmer fires mean the Goldilocks zone is closer than it is around our hotter, brighter sun, but the water principle remains the same. And if you do the math for the entire galaxy, the recent survey means that tens of billions of Goldilocks planets are peppered throughout the Milky Way, with a hundred or so just in our solar system's immediate neighborhood. For planet hunters, that's an especially tantalizing prospect. Ground- and space-based telescopes have discovered many hundreds of worlds orbiting stars other than the sun  several thousand if you include likely but unconfirmed planets found by the orbiting Kepler probe. But most of them are so far away that the prospects of actually being able to determine whether they have life are exceedingly slim, even with a new generation of giant telescopes, because the planets themselves are so dim. With so many M-dwarfs right around the cosmic corner, however, and with so many relatively small planets orbiting in their habitable zones, the job will be orders of magnitude easier. That's the good news. But there are a few caveats as well. For one thing, it's not guaranteed that a super-Earth will necessarily be all that much like the real Earth. In our solar system, there's a significant size gap between Earth and Neptune, the next biggest planet, which is four times as big and 17 times as massive as our home world. Earth is rocky, while Neptune is made mostly of water, ammonia and methane. Nobody knows where the cutoff might be between smaller, rocky worlds and larger, Neptune-like planets, but it might well be smack in the middle of the super-Earth range. A super-Earth known as GJ 1214b, discovered in another M-dwarf survey, is 2.7 times the size of our planet and is almost certainly a mini-Neptune. It's not in its star's habitable zone, but it wouldn't be a nice place to live even if it were. Another super-Earth, Kepler 10b, is 1.4 times Earth's size, and it's unquestionably rocky  although it's far too close to its star and far too hot to be habitable. Moreover, even if a fair fraction of the nine nearby super-Earths the Europeans have discovered turn out to be rocky, there's another problem: M-dwarfs tend to be volatile beasts, with far more sunspot and flare activity than the sun has, along with greater fluctuations in brightness. It might be tough for life to arise and survive in such a hostile environment, especially since the Goldilocks planets would be closer to all the flaring than Earth is to the sun. All the same, given M-dwarfs' ridiculously high, almost beetlesque, numbers, you could cut out all the M-dwarf planets that were too big and those that were outside the stars' habitable zones and those where changes in radiation and brightness were outside acceptable ranges, and you'd still end up with a huge number of potentially life-friendly planets. And that makes them perhaps the most promising targets in the search for alien organisms that the planet-hunting community is ever likely to find.